When Brooklyn Nine-Nine premiered three short weeks ago, it was defined by well-rounded performances from Andy Samberg and Andre Braugher and a supporting cast of caricatures. Now in its fourth episode, the series has reversed course almost entirely—if briefly—by rendering Samberg’s Peralta and Braugher’s Holt as cartoons off whom the rest of the cast establishes its characters. In “M.E. Time,” Peralta joins Diaz as secondary on Boyle’s investigation of a potential homicide. Despite the case being Boyle’s responsibility (and Diaz’s frequent reminders of that fact), Peralta immediately cases the scene and assumes the corpulent corpse arrived at his current state by natural causes. The titular medical examiner arrives to inspect the body, and Jake is suitably smitten. Peralta’s cocksuredness extends so far as to prevent the M.E. from performing an autopsy by taking her out on a date, after which the two explore her necrophilic tendencies. Repeatedly. While Jake is busy having his appendix fondled from the outside, Boyle uncovers clues that suggest what was obvious from the moment Diaz second-guessed Jake’s initial non-homicide call: the man was murdered by his wife. 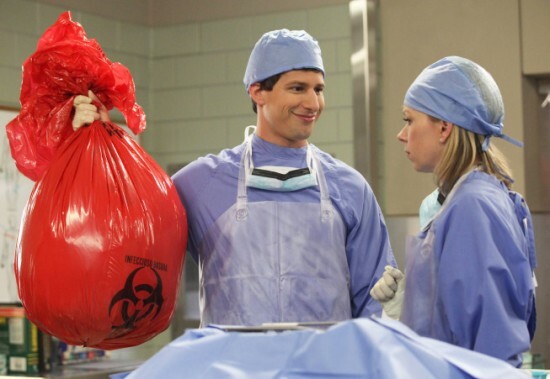 Boyle and Diaz go to the M.E.’s lab, where they find she still has yet to autopsy the victim and that a towel-clad Peralta is hiding in one of the morgue’s drawers. To this point in the episode, each of the characters felt like they were beginning to stagnate in their defined roles. Sure, Rosa was trending more toward sympathy and Terry is becoming generally less shouty, but no character had yet risen from his or her station in an attempt at self-improvement. Although this might reflect reality, we do not watch television to be reminded how futile such endeavors might be. Thankfully, Boyle—Charles (or Chuck! ), if you will—stepped out of his timidity and lectured Peralta, albeit in a very Boylean manner, about his self-centeredness. It was Boyle’s case, after all, and Peralta’s foray into human anatomy studies delayed the eventual apprehension of a murderer. It is refreshing that Boyle, who had been content to simply be a little buddy (so much so that his music choice for the drive to the crime scene was “Consider Yourself” from the Oliver! soundtrack), finally spoke up for himself and advanced his character. It is doubly rewarding that this happened in the presence of his crush, Rosa, who will almost certainly view his new confidence favorably. More exaggerated than Peralta’s self-absorption, however, was Holt’s stoicism, so much so that it rendered Braugher’s deadpan a running joke that failed to capture what made the affect amusing in the first place. “M.E. Time” showed continued growth for the off-poster characters in Santiago, Diaz, Boyle and Jeffords (who reveals his artistic side), but at the sacrifice of the Jack and Liz of Brooklyn Nine-Nine in Holt and Peralta. Adding to this problem was a humor deficit as compared to previous episodes. All that said, this is likely just a bump in the road for what will continue to be an enjoyable series.